Lemons have for long been used to add a zing to food, in refreshing lemonades, as home remedies for many health issues and the list is endless. They are rich in Vitamin C, are anti fungal, anti-bacterial and antiseptic. Just like lemon, lemon essential oil is also versatile in its benefits. It literally is a host of benefits packed in one tiny bottle. Not only does it provide a burst of freshness, but also benefits the health in many ways. Lets see here some health benefits of lemon essential oil. Other than those suffering from asthma, everybody else can inhale the steam from hot water with a few drops of lemon essential oils for relief from wheezing, cold and cough. In a big bowl of steaming hot water, add 4-5 drops of lemon essential oil, place your head above the bowl, cover your head with a towel and inhale the steam for a couple of minutes for relief. If you suffer from bad breath and want to fight it while also dealing with the germs in the mouth, lemon essential oil is the way to go. In a glass of warm water, add one drop of lemon essential oil and mix well. Use this water to gargle every night to fight bad breath and germs. Once a week, you could also add a drop to your toothpaste while brushing for better cleaning of the teeth. If you have brittle nails or a fungal infection in the nails, mix equal parts of lemon essential oil with coconut oil and massage your nails well with it. Do this for a week for stronger nails. Lemon essential oil is obtained from lemons so it is edible. Add a drop of the oil to your cup of green tea to soothe a sore throat. Lemon oil also helps in relieving anxiety and stress. Add a few drops of lemon essential oil to potpourri at home, dab some on your pulse points or add a few drops into your bath water soothe and calm your nerves. You know of lemon’s abilities to fight acne. More concentrated than lemon juice, lemon oil works doubly better in fighting acne. Apply topically on pimples or massage your skin with 1:4 lemon oil and almond oil mixture. This helps control acne and the oiliness of the skin. Lemon oil is great for fighting scalp infections like dandruff. 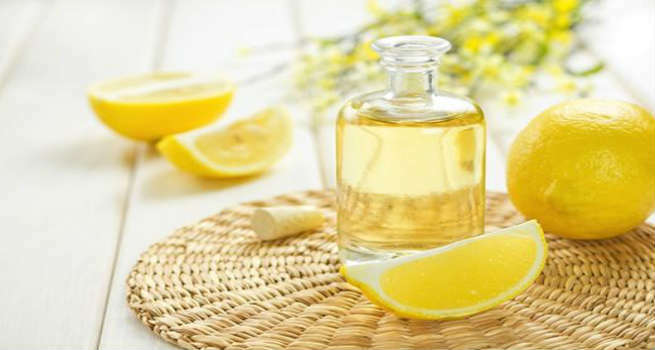 Add a few drops of lemon oil to your hair massage oil and massage well into your roots. It helps clear dandruff and add bounce to your hair. Adding a drop of lemon essential oil to warm water and drinking it neutralizes the acidity in the stomach and helps cure heartburn and provide instant relief. Drinking warm water spiked with a drop of lemon essential oil, first thing in the morning is a great way to kick start the fat burning process of the day. Use a drop of lemon essential oil in your lip scrub or body scrub to slough away dead cells and leave the skin fresh and smelling great!